If using bamboo skewers, soak in water 30 minutes. Cook pasta as directed on package. Drain; place in large serving bowl or dish. Meanwhile, heat gas or charcoal grill. 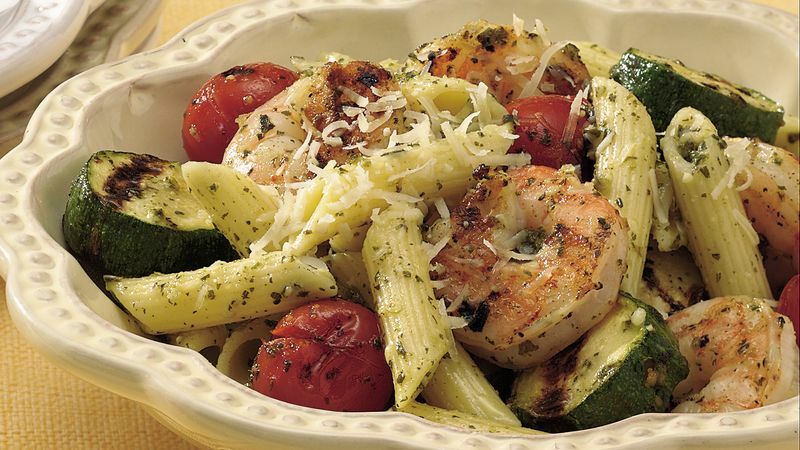 In large bowl, mix shrimp, zucchini, tomatoes and 1/4 cup of the pesto; stir gently to coat well. Thread shrimp, zucchini and tomatoes onto skewers. Place skewers on grill over medium heat. Cook 6 to 8 minutes, turning once, until shrimp turn pink and opaque and vegetables are crisp-tender. Remove shrimp and vegetables from skewers; add to pasta. Add remaining 1/4 cup pesto; toss gently to mix. Sprinkle with Parmesan cheese. Metal, flat-bladed skewers are best for grilling. Bamboo skewers are featured in this recipe; look for them in your supermarket. Soak them in warm water before using to keep them from burning during cooking. A hinged grill basket would work well with this recipe. This grill accessory is designed to enclose several pieces of chicken, fish or vegetables. It rests directly on the grill and is easy to turn. To broil shrimp and vegetables, place skewers on broiler pan. Broil 4 to 6 inches from heat using grilling times as a guide, turning once.